Wireshark, formerly known as Ethereal, is a great tool for network troubleshooting or any other task involving network packet capture and analysis. But you may have to build it yourself on OpenBSD, and if so, the compilation will probably fail. Here is how to successfully compile and install the Wireshark toolkit, setting permissions so you can capture packets without being logged in as root. The OpenBSD community hadn't built Wireshark packages for a while, since Wireshark has a bad security track record. Its packet dissectors (the modules analyzing the large set of supported protocols) are very complicated and prone to bugs. Making things worse, many people have believed that it has to run with root privileges. A privileged process running untrusted code leads to big security problems! On top of all this, the Wireshark community hasn't seemed to worry about making Wireshark build cleanly from source on OpenBSD. Yeah, I get it, do the capture only with tcpdump run as root and then use the enormous and less trustworthy Wireshark to decode and examine the result. Here is the trick for compiling Wireshark on OpenBSD, based on what I found in a guide for OpenBSD 3.8. The following worked with Ethereal under earlier versions of OpenBSD, and it works with Wireshark. Set two environment variables, changing the numbers as appropriate. If you see, for example, autoconf-2.59p1, then you should probably specify simply 2.59. Similarly, if you see automake-1.9.6p8, then you should probably specify simply 1.9. The ls command above is probably the most useful test. Run this script with the --help option to see what choices you have. Resist the urge to install it setuid-root as that is unnecessarily dangerous. See below for how to safely allow non-root capture. If it did not succeed, carefully read the output. Fix — Use an older version of Wireshark. I have had the above problem trying to compile Wireshark 1.0.4 on OpenBSD 4.4 through 4.7. 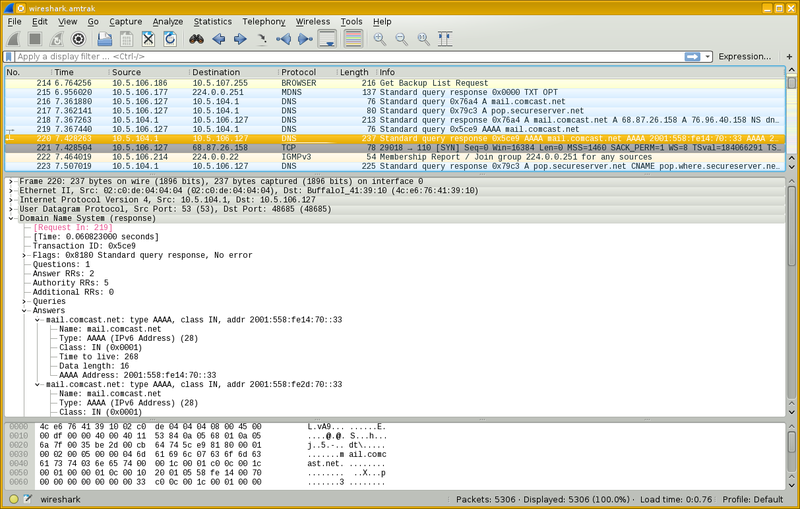 I rolled back to Wireshark 1.0.0 (I had kept the old tar files) and that version compiles and runs just fine. Possible error #2 — Some warning messages due to risky code in the wiretap directory may cause the build to halt because the -Werror flag tells gcc to consider warnings to be errors. This was a problem building Wireshark 1.0.0 on OpenBSD 4.3. By Wireshark 1.0.4, the Makefile came with that already commented out. Someone had noticed this! For more details see man bash and read the ulimit section. It is dangerous to run Wireshark as root because of the enormous and therefore buggy system of packet dissectors. The good news is that Wireshark supports privilege separation so the user interface (GUI for wireshark, text for tshark) can run as an ordinary user while only the dumpcap packet capture code runs as root. See the tcpdump manual page for comprehensive details.